Every queen has a past. Here's some of mine. 1995 -- The as of yet unnamed queen inside goes "full tilt" for the first time as she hosts the final senior year event, laughingly called the DUDS Ball. "Norma Desmond hosts a Masquerade Ball" was the theme, and she turned it out...and forgot all about a bosom. She'd learn. 1995-1996 -- Newly on her own in the world, she makes her debut in the $1.98 Beauty Pageant under the soubriquet, "Octavia Thunderpussy." The name lasts two performances before Scarlett O'Hara, den mother of the Gay Activists Alliance of Morris County rechristens her "Witti Repartee". When not performing, she joins the board of GAAMC as Corresponding Secretary and chair of the Welcoming and Orientation Committee. Witti spends much of 1996 and 1997 making appearances at Feathers and Connexions in Northern New Jersey. She loses monthly "Miss Feathers" pageants continuously for five months in a row. 1996-1997. Witti auditions for the part of Albin / Zaza in a semi-professional production of La Cage aux Folles in Rahway, New Jersey. Though cast as Mercedes, she finds a mentor in a queen from New York named Victoria Weston, who goes on to triumph as Zaza. 1997, Summer. Victoria invites Witti out to Cherry Grove to perform in "Out of the Mouths of Live Babes" at the Ice Palace. Imperial Court members La Diva, Jacqueline Jonee and Rose Levine welcome her to the cast, and later, offer sage advice. 1997 - 1998. Witti joins The Imperial Court of New York in October. Her first official event is Veronica Vera's book signing party, where she meets the fabulous Robert Sorrell. At her first Night of a Thousand Gowns, she's blown away by the pageantry, the pomp and the glamour, but also appreciates that it doesn't happen on its own. 1998 - 1999. The Emerald Empire is off and running. Empress Panzi and Emperor William name Witti their Press Secretary. Working with Prince Royale Gabriel Della Notte, works to create a new brochure for the ICNY. She also spends a term as Secretary of the Board. Meanwhile, on the other side of the Island, Witti joins the New York City Gay Men's Chorus as a "First Merman." 1999-2000. Witti continues her work on PR campaigns and has her busiest season with the Imperial Court of New York, traveling to Rhode Island and Buffalo with Emperor Chet and Empress Anne Tique. 2000 - 2001. Witti cheers as drag mama Victoria Weston and Board compadre Gabriel Della Notte step up as the new monarchs for a reign of Terror and Determination. She joins the board of the New York City Gay Men's Chorus and continues her work as an ambassador between the two organizations. 2001-2002. Work continues with the Gay Men's Chorus as Witti performs a solo as Mrs. Santa Claus (High atop the North Pole Lounge) at Carnegie Hall. Although she continues her work with the Imperial Court, her work to be the next Queen of the Chorus begins to consume more and more of her time. 2002 - 2003. Witti gears up for her successful campaign to be Queen of the New York City Gay Men's Chorus, and on the eve of her victory, begins a relationship with the fabulous Kerry Ashforth. She succeeds "Man Robinson" as host of "The Gayest Link" at Hannah's Lava Lounge, a favorite Hell's Kitchen gay bar. 2003-2004. Witti spends a year planning social events, outreach and membership activities for the New York City Gay Men's Chorus! 2004. Witti tells Michael that it's time to visit her family in the deepest reaches of Alaska, and departs the East Coast, sending the occasional "Wish you were here" Postcard. In 2006, Michael and Kerry travel to visit her. She tells them that she's met this fascinating woman named Sarah -- she can't stand her, but she can't turn her eyes away either, and that she'll come home as soon as she figures out why the national Republican Party seems to care about this novice in Juneau. 2009. 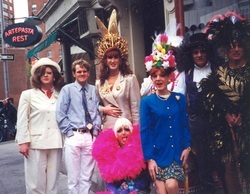 Witti rejoins the Imperial Court of New York and reboots "The Lords and Ladies Show" before turning it into "The Nobles Show" in 2010. She begins performing with ICNY throughout the metropolitan area and starts building relationships with other organizations. 2012. Witti ascends the throne as Empress XXVI of New York with Emperor XXI Ritz Kraka at her side. During the next year, she will make more than 160 appearances in New York City and perform nationally from Anchorage Alaska to Washington DC. 2013. Witti's term as Empress ends and she begins looking at other options. In July she makes her first appearance in a burlesque show, performing with Uncle Monty's Mollyhouse. In August, she makes her actual burlesque debut with Matt Knife's Homo Erectus Troupe, a company she will appear with multiple times throughout the year. In October, she hosts The Eagle's Halloween Party and Contest and is asked to take on the gig in the future. She also serves as the Team Angle for Cycle for the Cause's Team Eagle, and helps them become the top fundraising team of the year. 2014. Witti continues her work with Team Eagle, makes her solo debut with Lifebeat's Hearts and Voices Program and adds to her burlesque calendar with performances at The Slipper Room (May), Powerstrip Boylesque (June) and Bushwick Burlesque (July.) She's asked to co-host the show at Folsom Street East. 2015. Continuing work as the Queen of the New York Leathermen, adds a monthly show at Excelsior Bar in Park Slope on Thursday Nights; Produces the second annual Broads, Bawds and Bachelorettes, the 4th Annual 39th Birthday Party and co-founds Kaleidoscope Collaborations with Nick DiCeglie. 2016. The work continues with Team Eagle, the leather community, regular performances in cabarets around town, and the debut of a film by Bryan Mark Urbsaitis, featuring Reverend Yolanda, Candy Samples, Robusta Capp and Cooper Douglas. Witti also serves on the regular judges panel of the Metropolitan Room's "New York's Next Top Drag Queen" competition. The newly crowned "Wicked" Queen of the NYC Gay Men's Chorus, 2002. Folsom Street East in 2001. With Queens of the Chorus at 2002's Night of a Thousand Gowns. 1995. So concerned about the outfit and the makeup, she forgot the bosom. 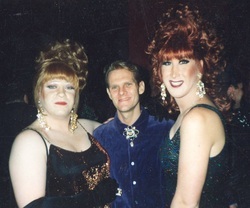 1997 with the fabulous Jacqueline Jonee, backstage at Victoria Weston's "Out of the Mouths of Live Babes." An official judge at the Gay Pride Parade in 1997. Backstage at La Cage aux Folles. The Glammy Awards with the ICPR's, Chet and Anne Tique. My first Night of a Thousand Gowns with Brenda Starr. My second Night of a Thousand Gowns with Shonda Lear.